BrainNet Library - A neural network library designed and implemented in .NET. The project is implemented in Microsoft.NET. You can use this project to design entity relationship diagrams, to generate database and program code out of it. The project is in Microsoft Windows/Visual Basic 6.0. ER diagrams can be imported from databases and existing program code (classes). 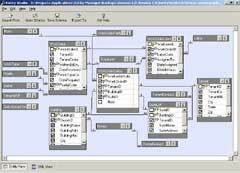 An Entity relationship diagram is something like a relationship diagram you see in Microsoft Access. This project provides a small environment to work with ER diagrams, an XML language and its DOM to describe these ER diagrams, and a control that can be used to visually represent these ER Diagrams. You can write your own plugins to export ER description to various target platforms (like ASP code, Oracle queries etc).